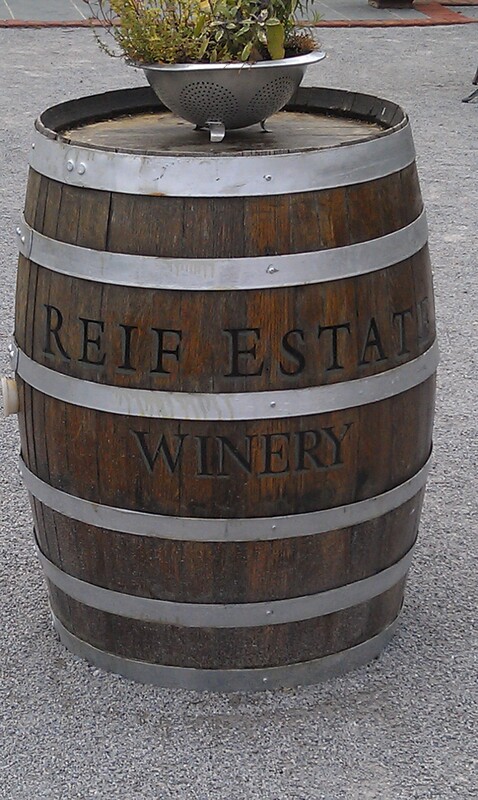 Reif Estate Winery is one of the original wineries in NotL – founded by Ewald Reif in 1983 and situated within yards of the Niagara River. Klaus Reif took over in 1987 after graduating from the Geisenheim Institute in Germany with degrees in both Oenology and Viticulture. Their winemaking history goes back 12 generations, so one must assume its in the blood. With 125 acres, this winery is just off the Niagara Parkway, so its popular with the bike riders and “hen parties”. However, they do have an interesting and well appointed back bar where they do tasting experiences – pairings, blind tastings, and special tastings – for a slight upcharge from normal tasting prices. Its worth the extra dollars to not fight the crowd at the tasting bar. Borrowed Image – so you can see the Room, and not the crowd. Going back to my Virginia roots, we tasted the Vidal. This is a wine I’ve had a fondness for when its on the dry side, and their 2011 does not disappoint. A fruit forward and balanced wine, the vidal has crisp acidity on the finish. A bit of Grapefruit and peach on the mid palate makes this an easy drinking summer wine that can be paired with any light summer dinner, or sipped on during a steamy day. At $9.95, its one of the best Vidal values I’ve seen. The Gamay Noir has an enticing blend of raspberry and cherry on the nose. I really enjoyed the pepper finish and its a well balanced wine with smooth tannins. Gamay is flourishing in Niagara, and Reif does an excellent job with it. $16.95 retail. The First Growth series are harvested from the oldest vineyard blocks and are created for extended cellaring. The 2007 Merlot presents with leather and plum – the finish is very dry with puckering tannins. Even at 5 years old, this wine should be decanted now, and can easily cellar another 5-10 years to integrate those tannins. This one retails at $50. Their Riesling TBA (Totally Botrytis Affected) is everything a Sauterne should be, right here in Canada. The naturally occurring “Noble Rot” flourished in the vineyard in 2009, so the grapes were harvested and placed in a kiln to encourage growth of the bacteria. The result is a tangelo and truffle nose with lemon on the palate. Beautiful, and $50 retail. The tasting room is well staffed with educated associates, and their enterprise is well organized, even with the sheer number of folks visiting. The winemaker was spotted weaving his way through the crowds on this busy Saturday, and it seemed everyone we spoke with was in some way related. After producing wines for almost 30 years in Canada, the family tradition continues. Posted in Ontario, wineries and tagged gamay, gamay noir, Riesling, Vidal Blanc. Bookmark the permalink.